Yesterday (19 March) Nature Communications have published a research report, titled Patterns of satellite tagged hen harrier disappearances suggest widespread illegal killing on British grouse moors, co-authored by Natural England, which found that patterns of satellite tagged hen harrier disappearances suggest there is widespread illegal killing on British grouse moors. 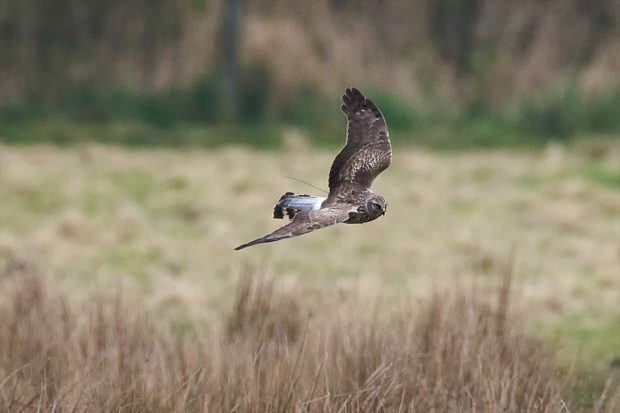 We also published a news story on Gov.uk, outlining the findings, which represent the culmination of a 10-year Natural England study involving 58 satellite tagged hen harriers. The analyses have been led by the University of Cape Town and Aberdeen University with the provision of land use data by the RSPB. This morning, there has been widespread coverage of the report in national newspapers such as The Times, I, Independent,BBC News, Guardian, the National and trade publications including the New Scientist. The articles factually report research on satellite tagging data of hen harriers in England suggests a strong evidence to support the claim that hen harriers are being illegally killed on grouse moors in England, stating 48 out of the 58 satellite-tagged birds have disappeared predominantly in the north of England in comparison to data for Scotland, and makes reference to the High Court Ruling won by Natural England on 15 March 2019 for Brood Management trials. The Independent also comments that this new report and evidence adds to pre-existing research that suggests hen harrier numbers in England are low due to wildlife crimes committed, increasing the pressure for grouse moors to be licensed. Hen harriers, like all wild birds, are protected from illegal killing by the Wildlife and Countryside Act 1981. Raptor persecution, including the persecution of hen harriers, is a UK wildlife crime priority, with hen harriers one of six species highlighted for special attention. We have strong penalties in place for offences committed against birds of prey. Anyone who kills or injures a wild bird could face jail if convicted. The National Wildlife Crime Unit, which is part-funded by Defra, monitors and gathers intelligence on wildlife crime, including raptor persecution, to assist wildlife crime officers. On behalf of Defra, Natural England is leading on monitoring work, nest and roost protection, and the southern reintroduction and scoping a trial brood management scheme. In delivering these actions, Natural England is working with a wide range of stakeholders including the various organisations with an interest in this area, individual members of the moorland community and estates.